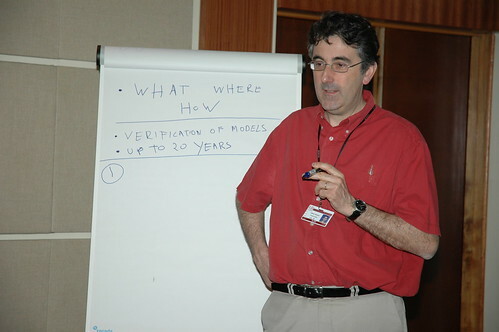 Olivier Hanotte, scientific advisor at the International Livestock Research Institute (ILRI), introduces himself and his work with the program. It is one of a series of portraits of key people in Africa Chicken Genetic Gains (ACGG). I’m a biologist by training and initially I wanted to do biology because I wanted to study birds–specifically population genetics of wild birds. I did my BSc on it and worked towards a PhD when I realized that I needed to get some money, so I did a postdoc study in the University of Leicester on chickens and I moved from wild to commercial birds. After a couple of years I decided that one good place to do research was Africa. I met the person who was leading the animal genetics program at the then International Laboratory for Research on Animal Diseases (ILRAD), now ILRI in Kenya, and I decided to go work there. But I started work in cattle genetics to contribute to a project on sleeping sickness tolerance, where I was accountable to Alan Teale and Ed Rege. I was investigating resistance to disease for Teale and for Rege I was working on the genetic diversity of cattle–leading the molecular component of that work. But I always wanted to work with birds. When the phase one of CGIAR Research Programs (CRPs) started, it felt like I was going in the wrong direction. I was supervising a team in Addis, Nairobi and China and the preparation of CRPs phase one was starting. During the week and weekends I was doing administrative work. I got bored of writing about things we were going to do, without keeping an active sense of the actual research. It was time to leave. And so I moved to the University of Nottingham to work on genetic research. Having spent 13 years at ILRI, I could get a professorship in the UK, which is not easy. But the move was good because, as one person once told me ‘always look at the direction the flow is going and go the opposite’. If you follow the flow you encounter much competition but going against the flow means you can discover the next steps. Coming to ILRI gave me opportunities I would never have had. Being a professor of genetics in the UK is great. I had an excellent time with the students. But I was missing the link with having an impact. The second phase of CRPs is about the fact that we are here to do research for development. In this phase, there is an emphasis again on science and there is a focus on multidisciplinary research and I think the system is mature enough to be able to do that now. That is what attracted me in coming back to ILRI. Now I want to finish my career by giving back what has been given to me by ILRI and the UK system. I welcomed the opportunity of working with ACGG because of its focus on chickens and I wanted to work in Ethiopia this time, to encounter a different culture and experience a new country. I am here for a minimum of three years and I am seconded by the University of Nottingham. Animal genetics flagship leader for the Livestock CRP phase 2 (officially starting in January 2017) but that entails writing proposals, budget etc. For ACGG I am providing scientific inputs and helping find out where there are opportunities to bring science in development. The next piece of work for me concerns ACGG but also the Dairy Genetic Gains project in the LiveGene team, as part of the 10K Livestock Genome Project. We are putting on the map the importance of exotic and local breeds. What is exciting today is that we now have the tools to understand, for example, why local breeds survive while the exotic ones do not generally. 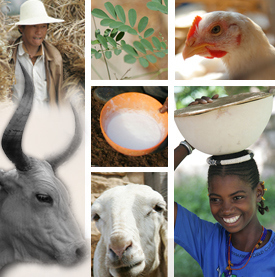 the demands for improving productivity immediately by identifying major adaptive diversity, providing then new avenues for breeding and in particular for tailoring the breeds to the local needs. The 10K Genome Project is in an early phase but it has very strong capacity development component and we aim in parallel in this project to develop bioinformatics capacity on the African continent. The modus operandi of this project is that it will be country-driven: once we have secured the money, we will be inviting countries to be part of the project. ACGG is a particularly important project because it is the first project which will examine and compare, at large scale, how different poultry strains are behaving on the ground. We will be comparing exotic chickens with indigenous ones. This has already been done before but the particularity of ACGG is that all exotic strains are in fact improved strains which have been developed to thrive in tropical environments. These strains are more productive than local ones and in theory should represent quick solutions to improve productivity in sub-Saharan Africa. But we don’t know for sure. What the project aims to do is to compare different strains at village level with the local ones. We will have enough data in different environments (three countries and five sites in each country) to be confident regarding the findings. It is a large study involving hundreds and even thousands of birds so we are confident that the data will be robust. As a scientist this is for me one of the most exciting things about the project. And as someone who also wants to make a difference on the ground, the project provides fantastic entry points because of the size and the second phase of the project which will imply large-scale dissemination of the strains identified previously. Because of the short generation time of chickens (21 days) we can expect that any intervention will have an immediate impact at the smallholder level. This is probably unique in the livestock sector–excluding fish. All concerns are solvable if you are imaginative. The project will need to bring on board all the partners and ensure they understand the philosophy and are able to deliver. This includes ensuring they see the global picture and not just their interest in the project. This challenge is being addressed through innovation platforms involving different stakeholders etc. Better food and more money leading to better education for the children. That will be, I think, the ultimate objective. Of course we want to feed the people and make them richer but education is the –uncontrollable–final objective. Normally when people eat better and have more money they pay more attention to better education. As CGIAR scientists our responsibility is to do the best science and respond to the needs of people. It is very important that, as ILRI/CGIAR scientists, we realize we cannot afford to do second-hand science for development. We have to be as good as researchers in the developed world, we have to publish in the highest impact journals, because we are working on problems that have such a global importance that it should be an entry point to publishing in such high profile journals. Failing to do that means we are failing generally. This has to be recognized and the system has to be very conducive for that. Personally I think that you can see there is demand for such quality research, particularly in the young generation. The youth are eager but they sometimes do not realize the level they have to reach. Tags: Olivier Hanotte, voices. Bookmark the permalink. ACGG project is a blessing. Therefore, one expects the very best as he contributes his quota towards the success of the project.